Halloween can be a tricky time of year when you’re conscious of what you’re eating (and especially if you’re avoiding sugar altogether). A quick look at the candy aisle of reveals all kinds of non-foods packed into traditional Halloween treats: corn syrups, binders, preservatives, emulsifiers, food dyes, flavoring agents… all things that the body doesn’t love and won’t leave you feeling great. Luckily, with a bit of creativity with whole food ingredients, you can whip up some festive snacks that aren’t quite so Franken-food. Stay on the clean-eating band wagon with a few of our favorite plant-based, sugar-free Halloween treats. Toppings of your choice: cacao nibs, goji berries, shredded coconut, chopped almonds, sesame seeds, sunflower seeds, crushed banana chips, etc. Process dates in blender until smooth and paste-like; add a little water to smooth out if needed. Transfer to a bowl and set aside. Divide toppings into their own individual bowls. Pierce each apple with a skewer and rotate in the date paste to coat evenly, then roll in topping of choice. Spread raw buckwheat in a large skillet and place over medium heat. Toast 5 minutes, shaking occasionally to toast evenly. Let cool before handling. Use a food processor or cheese grater to finely grate carrots. Combine carrots and pumpkin in a large mixing bowl, stirring until evenly mixed. Add flour, nut butter, cinnamon, nutmeg and salt. Mix thoroughly. 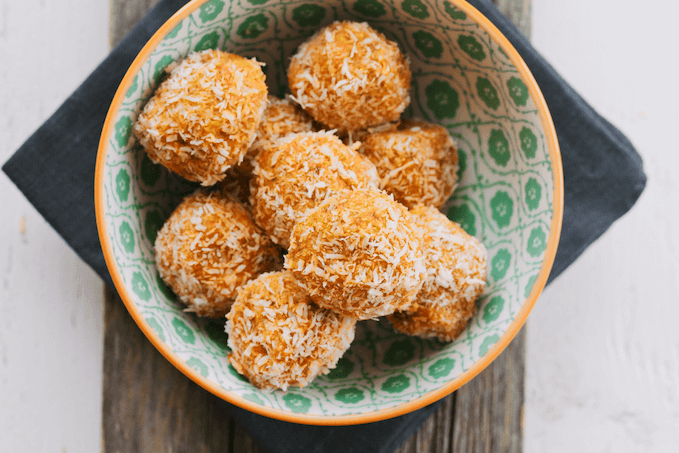 Use your hands to form batter into 1" balls; roll in shredded coconut if desired. Place on waxed paper or parchment. Chill about 30 minutes until slightly firm. Store in a sealed contained in the fridge for up to a week. Process dates in a food processor until a thick paste forms. Add nut butter, vanilla and salt and continue processing until combined. While this blends, line a baking sheet with parchment paper. Scoop date mixture into a bowl and set in the freezer for 15 minutes until it stiffens slightly. Use slightly moistened fingers to shape mixture into 15 to 20 ¾”-spheres. Place these on baking sheet and return to the freezer 10 minutes. In the meantime, melt chocolate and coconut oil in a saucepan over low heat, stirring occasionally, until 2/3 of the chips are melted. Remove from heat and continue to stir until the mixture is uniformly smooth. Remove caramels from freezer and dip carefully into chocolate to coat. Tap any excess chocolate off and return dipped caramel to baking sheet. Repeat with each caramel. Return to the freezer for another 20 minutes or so, until firm. Find more sugar-free recipes (and get the grocery list) on PlateJoy!